Since surface air pressure is a measure of the weight of the atmosphere above any location, a low pressure area represents a region where there is somewhat less atmosphere overlying it. Low pressure areas form when atmospheric circulations of air up and down remove a small amount of atmosphere from a region. This usually happens along the boundary between warm and cold air masses by air flows "trying" to reduce that temperature contrast. The air flows that develop around the low pressure system then help to accomplish that reduction of contrast in temperature, with the colder air flowing under the warmer air mass, and the warmer air flowing over the colder air mass. 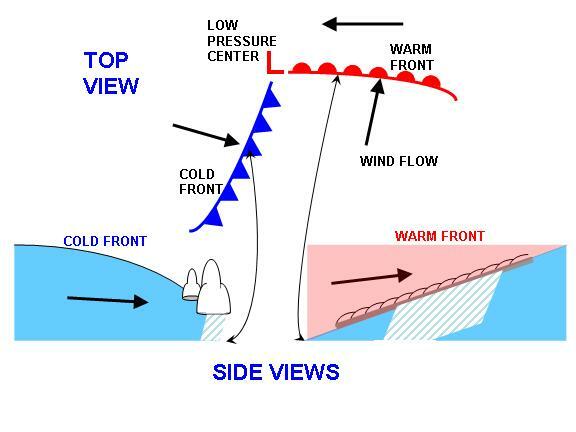 "Thermal lows" occur when an air mass warms, either from being over a warm land or ocean surface. For instance, a very weak thermal low forms over islands heated by the sun, which then causes a sea breeze to form with oceanic air flowing toward the island. Similarly, very cold winter air flowing over the Great Lakes produces localized low pressure over the relatively warmer lake waters. Low pressure can be enhanced by the air column over it being warmed by condensation of water vapor in large rain or snow systems. The warming causes the air layer to expand upward and outward, removing some of the air from the column, and thus reducing the surface air pressure. The most extreme example of this is the intense low pressure that forms in the eye of a hurricane, where latent heat release from rain formation causes warming of the air column within the eye. It the most intense hurricanes and typhoons, over 10% of the atmosphere can be removed from the eye of the storm through this process. But outside of the tropics, as mentioned above, low pressure centers are usually associated with extratropical cyclone systems, along with their fronts and precipitation systems. The lowest air pressure in the world occurs in intense tropical cyclones where condensation of water vapor to form clouds and rain releases heat that warms the air column in the eye of the storm. The lowest pressure ever recorded was in the eye of Typhoon Tip, in the tropical western Pacific Ocean, on October 12, 1979: 25.69 inches of mercury (870 millibars). Since average sea level pressure is 29.92 inches (1013.23 millibars), this record pressure was about 14% lower than normal, indicating that 14% of the atmosphere's mass had been removed from the column of air.